I believe that the most important skill to be taught in any mathematics curricula is critical thinking. A student should leave my class knowing how to work through difficult problems, using a variety of strategies to develop solutions to these given problems. If a student has left my class, without learning various methods to process through challenging situations, then I feel that I have failed them. Critical thinking is crucial for students going out into the real world. There are many approaches to develop critical thinking skills. This comes more naturally to some students than others, and for some students the context is important to dig into those critical thinking skills. In most cases, seeing a problem from a different perspective helps students realize a bigger picture that there may be more than one way to solve a problem. This is a hard concept for some students to grasp because in math there is one correct answer, however, there may be more than one way to get to that answer. In this blog post, I am going to share with you a couple ways that I use error analysis to build critical thinking skills. Example 1: Where is the Error? About once a week, I use error analysis in warm-ups for students to decipher what another student did incorrectly. They have to look through a student's work, circle or explain the error that the student made, and then correct the work from where the error was made. This process helps students in two ways. First, I am able to address common mistakes that students make before they make the errors themselves. Secondly, this builds students confidence because they are made aware that other students make mistakes as well. For the attached warm-up, I shared this with students as a note (instead of the .pdf that you see) in Notability. This allows students to manipulate the work, instead of write over it. You can learn more about this Notability feature in this earlier blog post. Example 2: Who is correct? In this example, the work of two students is displayed. One is correct and the other is wrong. My students need to figure out who solved the problem correctly and what the other student did wrong. Again, this process allows students to see common mistakes that students make and forces them to explain why something is wrong, which builds critical thinking skills. Examples 3 & 4: Why is this wrong? Another great method to get students to think outside of the norm is to ask students why an answer is incorrect. 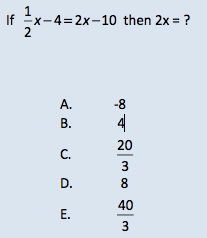 In a standardized test warm-up activity, I ask why an answer choice is incorrect. Students then have to work backwards from the answer to figure out what error the student made. Then, they provide the correct answer. The extra step on the front end ideally prevents students from making that same mistake when they are taking a standardized test. Analyzing distracters in standardized test questions also can address the common student errors of misreading the question or circling the wrong answer choice. For example, let's take a look at the problem below. Many times students solve for “x” correctly in a problem. The question, however, does not ask for the value of x, but instead it asks them to find the value of "2x". Distracter analysis can be used to address students reading the problem incorrectly. If you have any additional ways to use error analysis to build students' critical thinking skills, please share in the comments section!